The R wave is the first upward deflection after the P wave. It is part of the QRS complex and poor R wave progression can signal a problem. In a normal ECG, the S wave transitions to the R wave looking prominent. With poor R wave progression the transition comes later than it should. 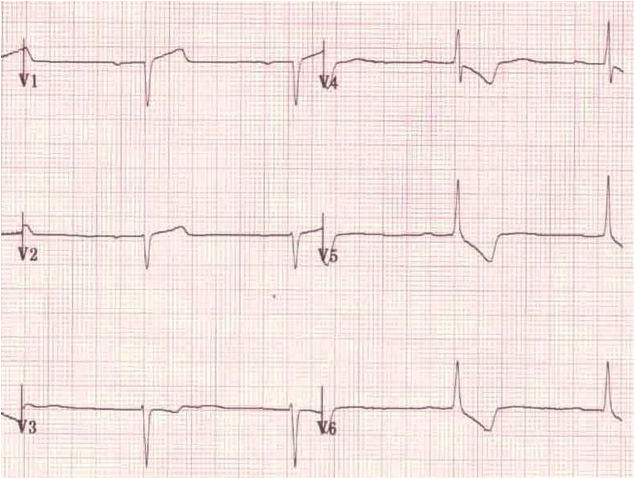 This article will outline ECG with poor R wave progression, the causes, and show a few image examples of the condition. First we need to understand the entire rS transition completely. Many people in healthcare feel they only need to identify STEMI (ST segment elevation myocardial infarction). This is the most deadly form of heart attack caused by a complete blockage of the coronary artery. Yes, it is important to be able to identify the ST elevation in this type of heart attack, but what about Anterior MI? What about hypertrophy? Poor R wave progression can be an important indicator in patient diagnosis. The R wave is the electrical conduction as it goes through the ventricle wall. They are thicker than the other heart muscle and need more electrical charge to do their work. This explains why the R peak is the highest seen on ECG. The R wave starts out small in lead V1 and gets progressively larger until around lead V4 and then becomes small again. This is normal r wave progression. When there is an issue such asAnterior MI, Wolff-Parkinson White syndrome, Pneumothorax, or congenital heart disease the R wave doesn’t quite peak as high as it should and progression to the peak seems slower. This can also happen when the ECG arm leads are reversed and this issue is easily remedied by switching the arm leads to the proper position. Poor R wave progression can be identified by the timing of the R wave peak. 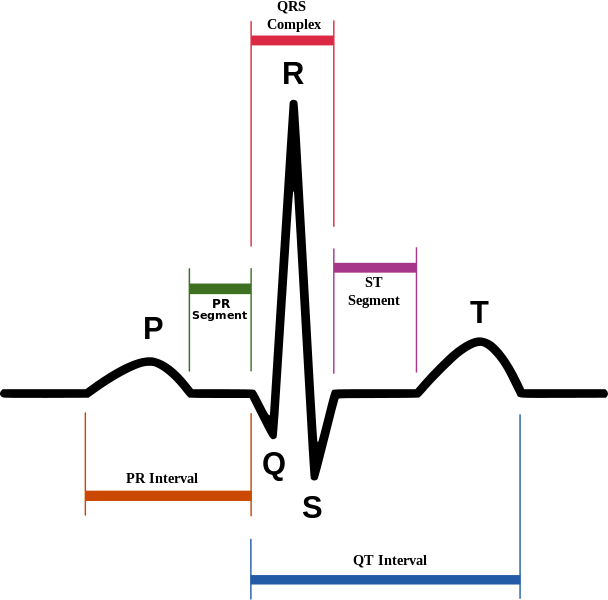 The following ECG tracings show the slowed progression, along with other signs associated with the issue being diagnosed. Here is an example of poor R wave progression. Compare it to the above picture of a normal rS transition and you can see in Figure 2, the transition is almost absent. This is an ECG of someone with either Dextrocardia (Heart pointed to the right) or it can be caused by reversal of the arm leads during ECG testing. Dextrocardia is a congenital heart defect, so you will be alerted to this in adults presenting for ECG. If there is no previous history, then consider arm lead reversal. This ECG shows poor R wave progression to the anterior leads and there are Q waves in V2 through V4. This is a classic abnormal ECG for Anterior MI. There shouldn’t be any Q waves in V2 through V4. There is also some elevation of the ST segment in leads V1 through V3, with some T wave inversion. If the transition is less than 5mm, anterior MI can be diagnosed with certainty of 95%. 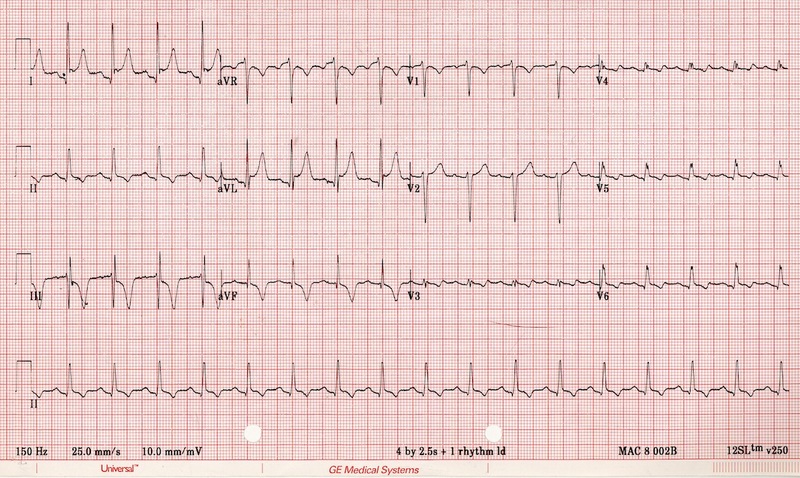 The abnormal ECG above is an example of Wolff-Parkinson White Syndrome. This is one of the other causes of poor R wave progression. 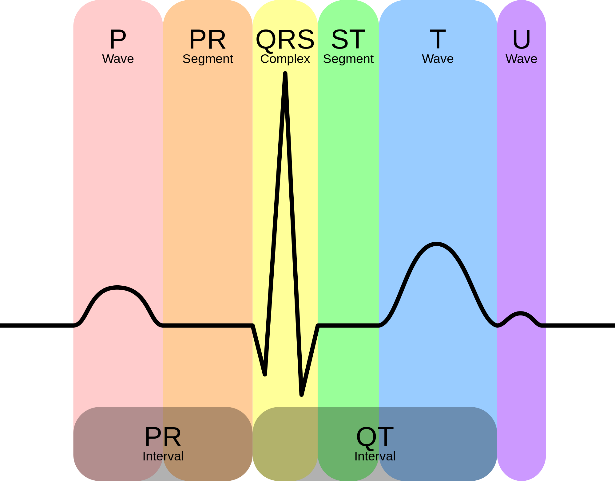 WPW needs to meet three criteria on ECG, one of which is slowed R wave progression. The other criteria arewidened QRS complex and delta waves. Delta waves occur when the ventricle is activated too early prior to the AV node being activated. In some cases, a poor r wave progression can occur from the limb leads being reversed. This is evident by no other changes on the ECG and everything appears normal with the exception of PR segment depression and an irregular R wave in leads I and II. In Figure 6, a patient arrived in the emergency department and was negative for cardiac disease in the past. He was complaining of chest pain. The patient is 30 years old with a B/P of 168/90 mmHg, pulse 56, and oxygen saturation 99%. 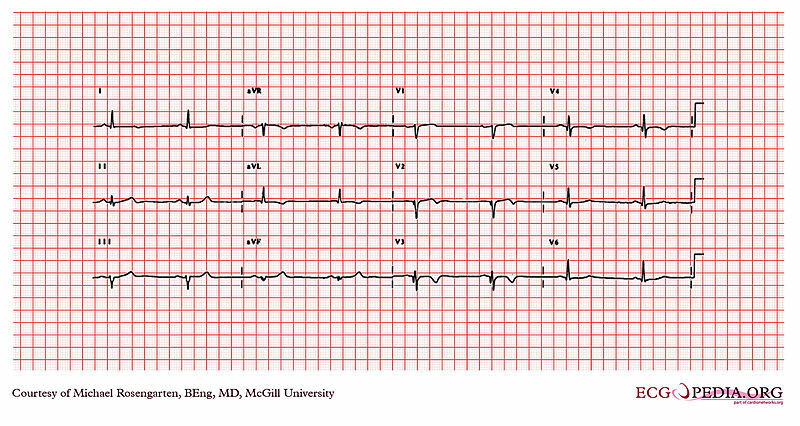 He had a normal sinus rhythm on ECG, but showed poor R wave progression precordial leads. His WBC’s were 7800. Creatine Kinase was 95. Echocardiography showed normal LV wall motion. His chest x-ray showed a left-sided spontaneous pneumothorax. The left lung was aspirated and expanded. After treatment, the poor R wave progression disappeared. Figure 6A shows the Chest x-ray and ECG of the patient with pneumothorax. Figure 6B shows the improvement after aspiration. Not performing the chest x-ray along with the ECG could have led to a misdiagnosis of Anterior MI and an unnecessary catheterization would have been performed. This can put the patient at risk and delay time to proper treatment. It is very common to mistake chest pain related to other diagnoses for MI. Understanding an initial ECG can help aid quick diagnosis and treatment for any cardiac etiology. Pneumothorax can look like an Anterior MI on ECG, but the poor R wave progression is actually cause by the heart being pushed to the side from air loss from the lungs. This is especially evident by a patient’s age and cardiac history. The chest x-ray helped to confirm the diagnosis and lead to immediate treatment and resolution of the issue. What Causes Plaque in Your Arteries?